What are quarks, and why do they have colors and flavors? Quarks make up all matter, but have never been seen by themselves. And they have "flavors" and "colors" — though neither term has any relevance to what they actually do. Let's take a look at why we need quarks to understand the world, and what their "colors" and "flavors" actually mean. For many people, the question is, why do we need quarks at all? This pops up a lot, especially when people learn that quarks cannot be separated from each other and so we haven't ever seen one on its own. Aren't elementary particles like protons and neutrons enough? Why do we need to break them up further, to understand the universe? The first problems with what were considered "fundamental" particles started springing up in the 1960s, when scientists shooting electrons at matter saw them veer off in different directions, seemingly for no reason. Looking at how and when the electrons changed direction, scientists concluded that the nucleus had to be made up of smaller parts, some of which the electrons were "running into." These parts were smaller than the protons that the scientists knew were in atomic nuclei. The parts, they realized, had to be inside the protons themselves. This new theory worked very well in explaining charge, spin, and mass. It helped put the many different subatomic particles in context. Instead of a bewildering number of elementary particles with different properties, there were only three, the combination of which made up the variety of particles that scientists had been discovering. It was a little like the realization that the many substances in the world could be understood as combinations of a relatively few number of atoms. Two different combinations of quarks could make up a proton or a neutron just the way two different combinations of hydrogen and oxygen atoms could make up a water or an acid. The only problem was, no one had any evidence that quarks existed - until something inside protons started making electrons zoom off in random directions. 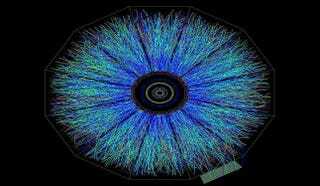 When the electrons scattered, the seemingly superfluous theory was confirmed. Over the next few decades, more quarks were added to the simplified system, bringing the number of quarks up to six. People found out why we hadn't found any quarks on their own. The force that pulls them together in pairs or threes grows stronger as they move farther away from each other, like an elastic band. Only incredibly high energy events can separate them for even a short time. Quarks can also change "flavor." While no one to this day has ever "seen" a quark on its own, experimental results and observed properties of particles match up so perfectly with the theory of their existence, and don't match up as well to any other theory, that scientists are satisfied that they exist. They explain too many things too well not to be in there somewhere. The name "quark" comes from a nonsense poem, which is fair enough — but a quick look at a summary of their properties makes it seem that the nonsense doesn't end at the name. They come in ''flavors,'' which, since they can't be tasted, means nothing. They have colors, and the study of them is called quantum chromodynamics, but it's clear that the don't have any color we can actually see. What are these strange properties and why do they have to be named in properties that they don't have? As said before, quarks aren't found on their own. They roam in pairs, and certain pairs always team up. The pairs are as follows, up and down, charm and strange, top and bottom. The first quark mentioned in each of these pairs had a charge of two-thirds of a proton unit of charge. The second quark in each pair has a charge of negative one third. In the original theory, two up quarks and a down quark add up to make a charge of positive one - or a proton. Two downs and an up have charges that add up to zero, and make neutrons. But if three quarks have positive two-thirds charges and three quarks have negative one-third charges, then why aren't there just two quarks total? What's the difference? Each of the quarks have just slightly different masses. This is why protons and neutrons, when studied, were found to have slightly different masses. The different combination of quarks gave them a different mass. This combination of charge and mass, as well as a few more esoteric qualities, make up the ''flavor'' of each quark. As to why they can't just be called ''types'' — perhaps we should ask James Joyce. In the end, quarks are so mysterious because their properties are nothing like what we experience in the macro-world, and yet they are named for properties we're perfectly familiar with. Translating between a color as we see it and a color, as in a mode of being dictated by mathematical and experimental results, is disorienting. The best way to understand quarks is to understand that, rather than being exotic, they serve as a way to organize and simplify the sprawling subatomic world. They're a kind of periodic table of elements - for the elements. Will scientists find anything smaller? Who knows, but if they do, let's hope they name it after something from Jabberwocky. I'd like to see a physics lecture on "mome raths." Via NASA twice, Hyperphysics three times, Particle Adventure, and Duke.